For those who pride themselves in rigidity, perhaps this dance is a crime. When common sense shows up with some cheer and frolic, all that these righteous folks can see is insolence and obscenity. Whenever common sense is expressed with some aplomb, they cry foul, and quite foully as they do here. Perhaps before rushing into judgments about the ‘right and wrong’ of the images they find offensive, perhaps they should look at the images carefully, from left to right. For instance, look at this one. What do you see? Scroll down for answers. 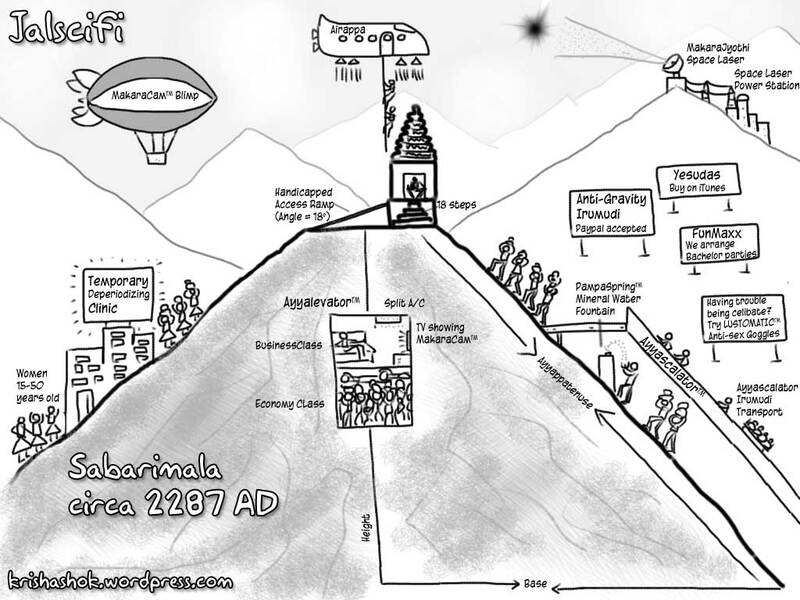 From left to light, the cartoon lays bare in black and white the medievalist misogyny perpetuated by the orthodox establishment, class warfare in religious frontlines, crass commercialization of shrine boards, environmental degradation and zoning violations in heritage sites, and the tabloidization of folk religion. So much truth in one image understandably hurts! Any ‘defender of the faith’ worth his salt, would take seriously the critique in the cartoon and take measures to reform the faith that is so dear to him. Apparently however, the only authorized expressions of faith are to take offence at the gentlest satire and take up arms at every imagined provocation. The HJS folks seem to be unaware of the Streisand Effect. To borrow Somerset Maugham’s words, we may prefer the ‘rapier of sarcasm’ but maybe forced to wield ‘bludgeon of invective’ at times! Keep the Jalscifi coming and keep up the good work of hitting the nail on the head, and nutjobs where it hurts.